Now that spring is here and we are emerging from hibernation, it's the perfect time to party with family and friends. Dannyelle from Life is a Party had the awesome idea of partying all through 2017 actually. 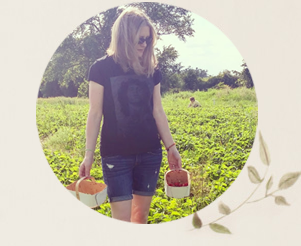 A bunch of us bloggers are joining her in celebrating "A Year of Feasting," with ideas for parties in spring, summer, fall and the "w" word. 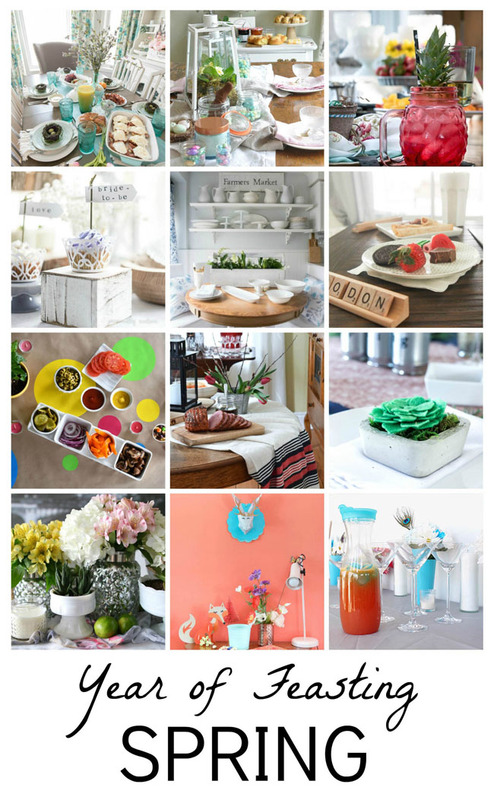 Check out the other bloggers' party ideas via the links at the bottom of this post. Such beautiful parties! 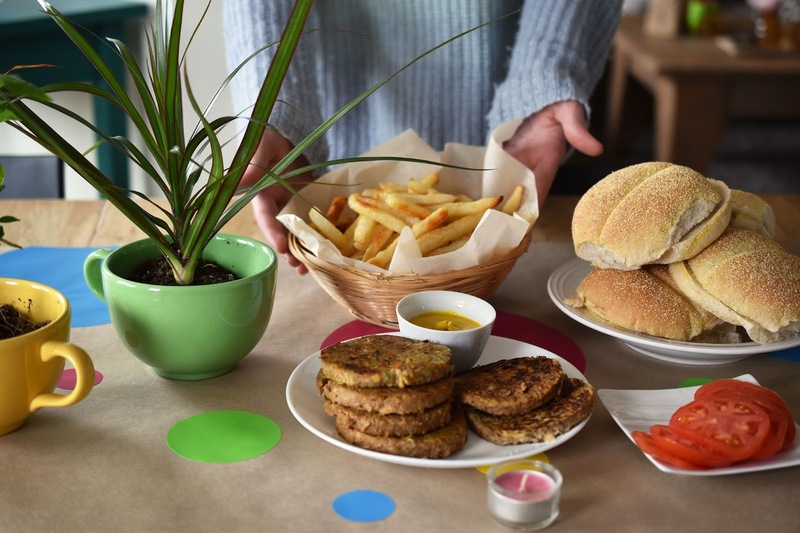 I decided on a simple, casual "Celebrate Spring" party for the family, featuring a veggie burger bar and vegan root beer floats. If you're a new visitor to the blog, hey! I'm Joann and I'm a vegan, while my husband and kids are vegetarians. But I promise we're really normal otherwise. Sort of. Between odd and the same, you gotta be rooting for odd, right? If you are in need of some meat-free meals, check out this abundance of vegan recipes. 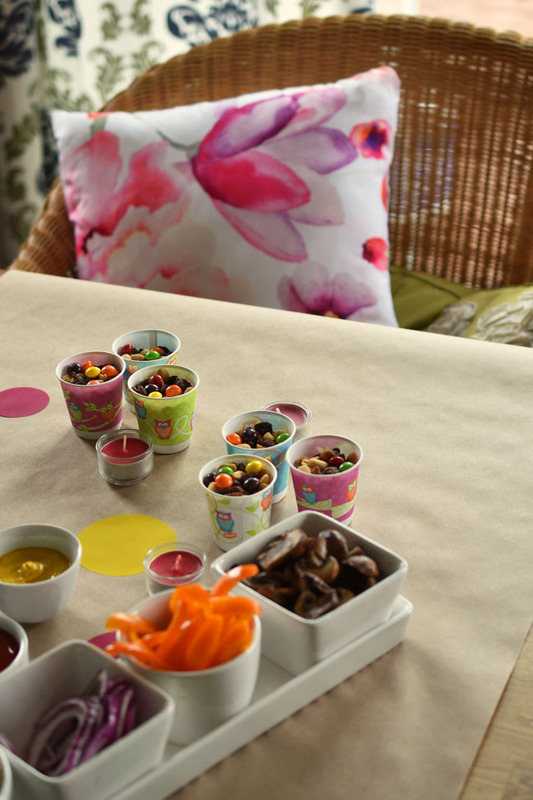 Our spring party is hosted by Giant Tiger and that's where my daughter and I found these fun, colourful glass mugs with lids and straws, perfect for patio season. (It's coming, I promise.) The glasses became the inspiration for our party's colour scheme - red/pink, blue, green and yellow. I also apparently had circles on the brain because, as you'll see, a whole bunch of the decor is circular. I found a green paper lantern among the party decor in my wrapping closet in the basement. It's green and it's round so it worked beautifully for the effect I wanted. 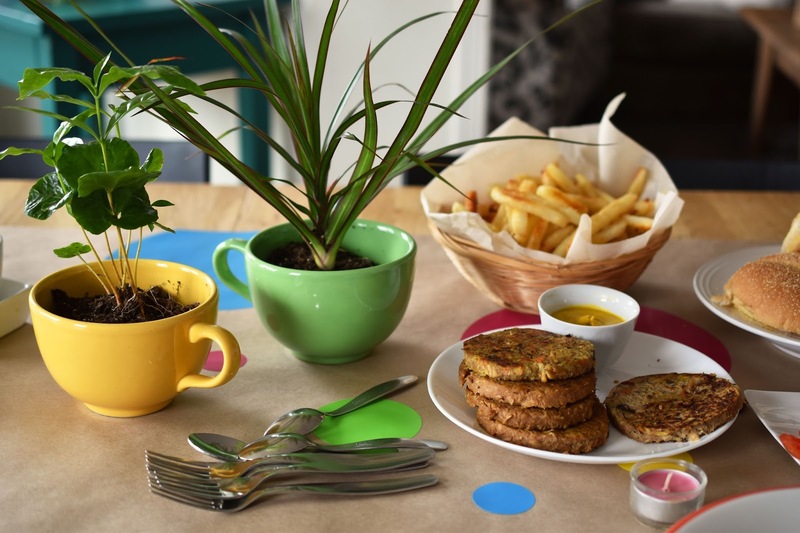 I found these two plants for $1.99 each at Giant Tiger and I transplanted them to big yellow and green mugs (round again, naturally). I also got lovely peach-scented tea light candles in three pretty pink hues at Giant Tiger. For our veggie burger bar, we had two kinds of veggie burgers (both from Sol Cuisine) - the regular veggie burger and the mushroom burger. We also had a basket of French fries, cooked from frozen. A spring party need not be complicated to be festive! 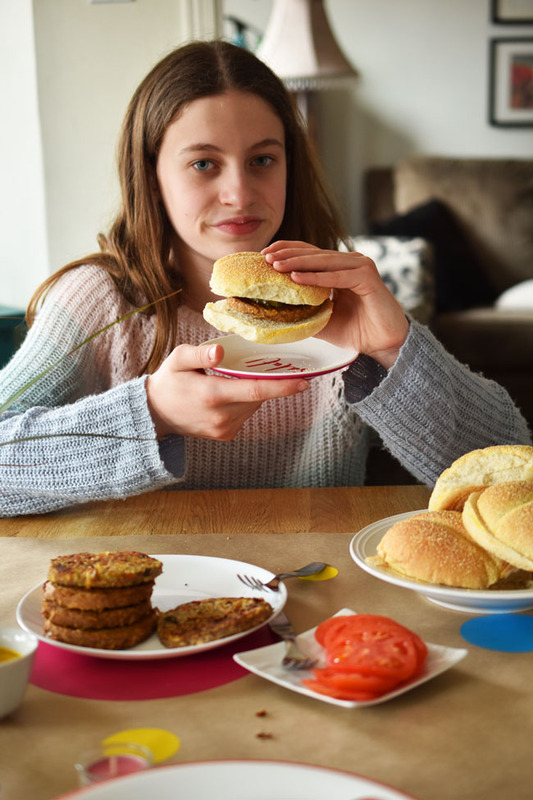 Although my kids are now 12 and 14, they still prefer simple food more than anything fancy. 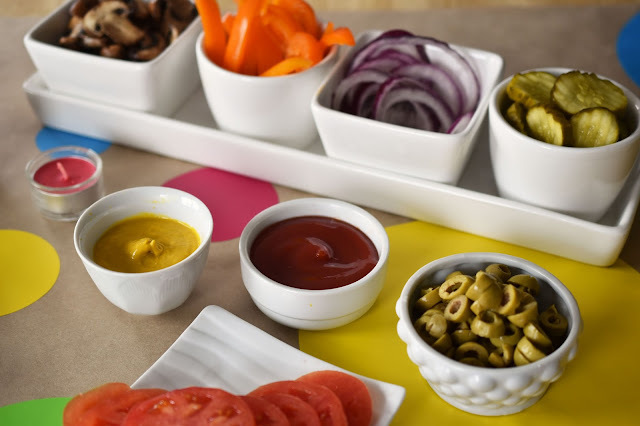 Your veggie burger bar toppings can be as simple or as fancy as you like. 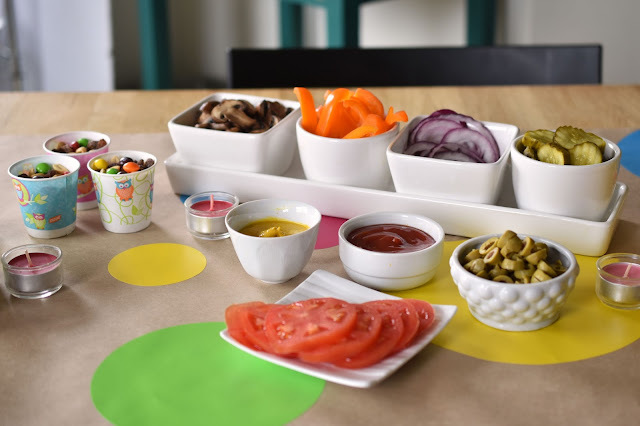 The kids tend to stick with ketchup and pickles. My son also likes mustard and green or black olives on his veggie burger. My husband and I like peppers, sauteed mushrooms, tomatoes and red onion too. I was able to get all these toppings at Giant Tiger while shopping for party decor. We added a pretty pink floral pillow from Giant Tiger to the chair at the end of our table for a nice spring-friendly touch. 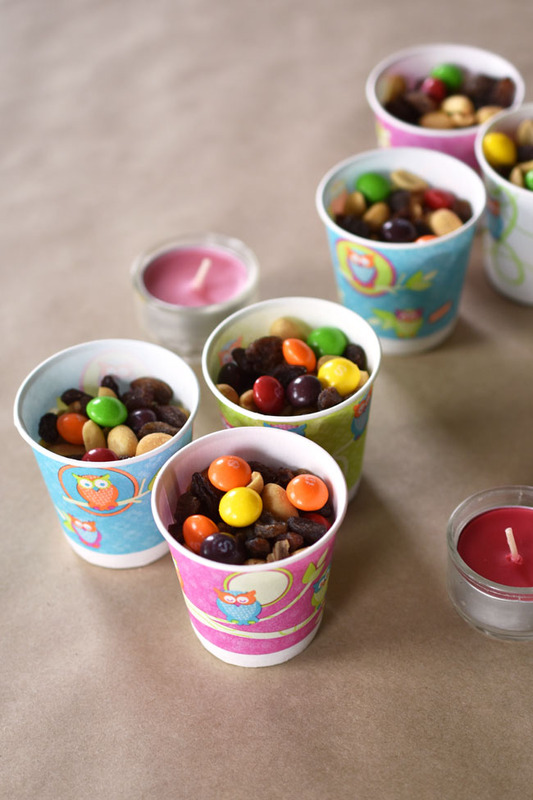 My daughter helped me fill Dixie cups with peanuts, raisins and a few Skittles (not healthy but round and colourful and hence perfect for our party "decor"). I confess I'm a bit of a germophobe so I'm not into big bowls of snacks that everybody is dipping into. I like individual servings of snacks when possible. For dessert we settled on vegan root beer floats. I created some text in the Cricut Design Space and had the Cricut machine write out "Root Beer Floats" on cardstock with a silver pen. It looks much better than anything I could have written on my own. 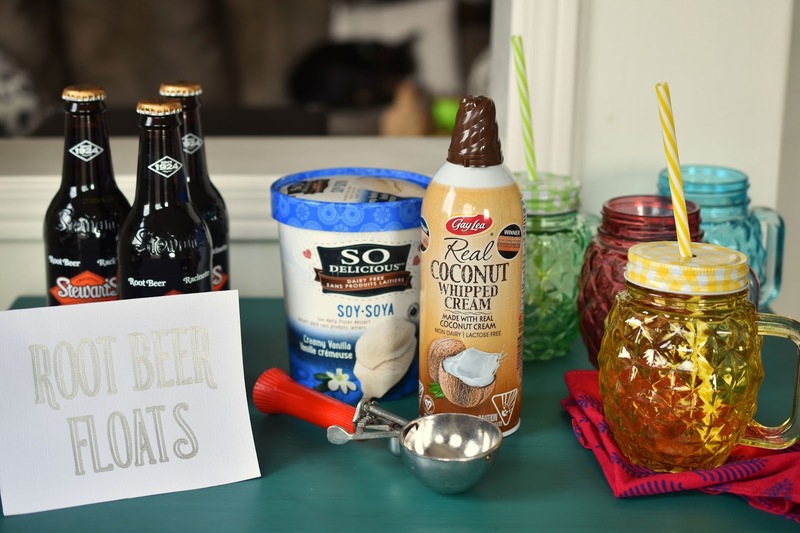 Making a vegan root beer float couldn't be easier. 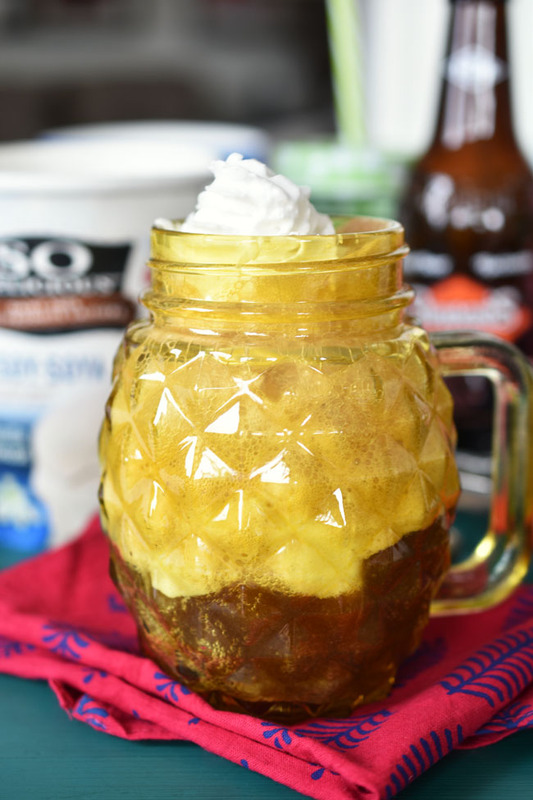 Just scoop non-dairy vanilla ice cream into a mug and slowly top with cold root beer, allowing the root beer to recede some before you add more. Top with more vegan ice cream or coconut whipped cream. Eat with a spoon and a straw! I hope you enjoyed this peek at our "Celebrate Spring" party with veggie burger bar and vegan root beer floats! My thanks to Giant Tiger for sponsoring our party. 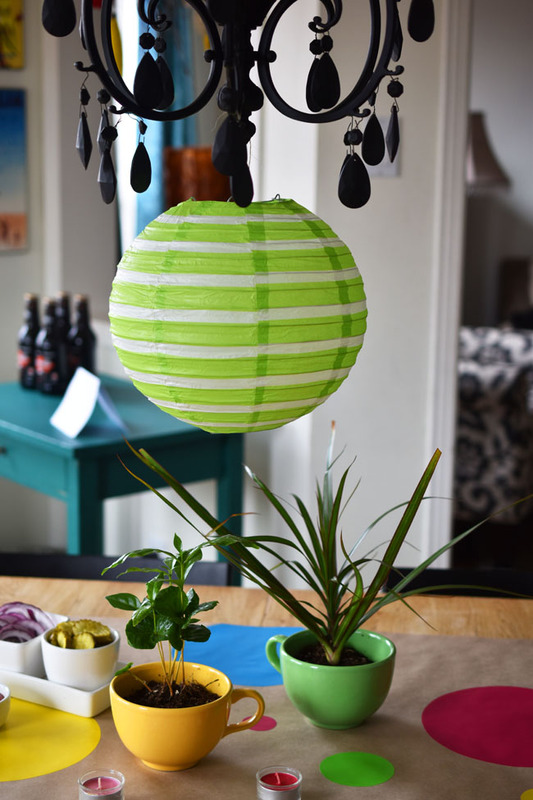 Are you planning any parties now that the warm weather is (kind of) here? We're not quite ready for eating outdoors here, but I'm sure that's where our summer party will take place. We have to take advantage of a short patio season! 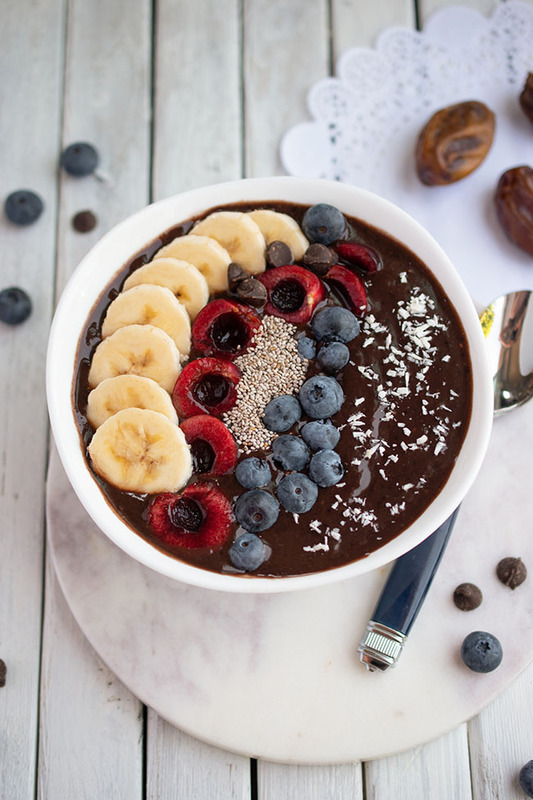 Now be sure to check out all these amazing spring feasts from Canadian bloggers, and we hope you are inspired to have your own #yearoffeasting! THE DIY MOMMY - LIFE IS A PARTY - VIN'YET ETC. When am I coming for dinner?! I'll take all of that! I love the idea of a rootbear station too! That looks like it was so fun and delicious! 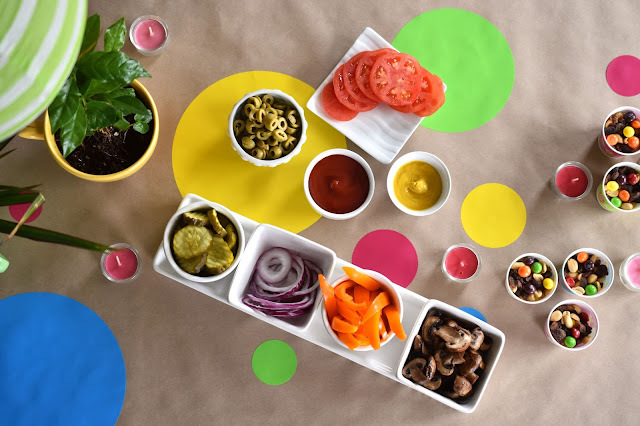 I love the circle theme and I've never thought of trying olives on my burger, mind blown!!! I think I have a new burger topping! The "w" word... hahaha, it doesn't feel like we're quite out of the "w" does it? 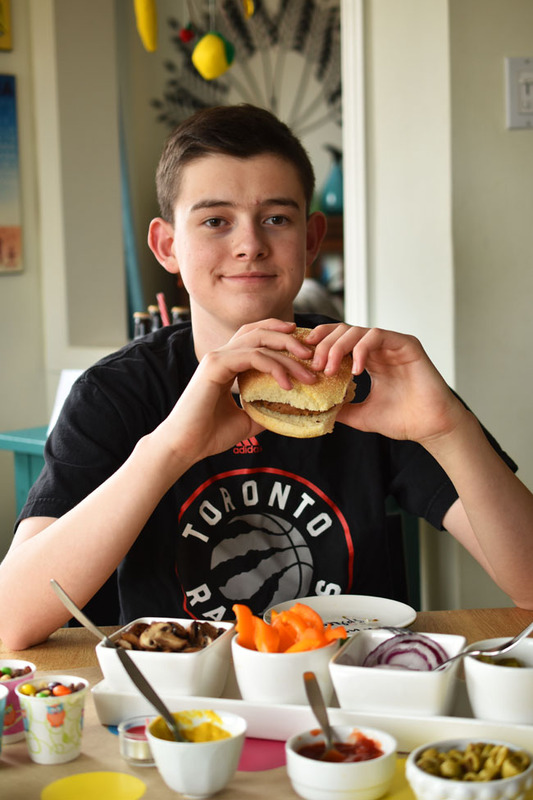 My son always gets olives on his veggie burgers at Harvey's. I wouldn't have thought of it. The "w" word is still dirty. We actually drove home in pretty much a snowstorm today!!! Thanks Laurie! Love your circle runner -perfect for welcoming spring. Looks like such a fun family party. 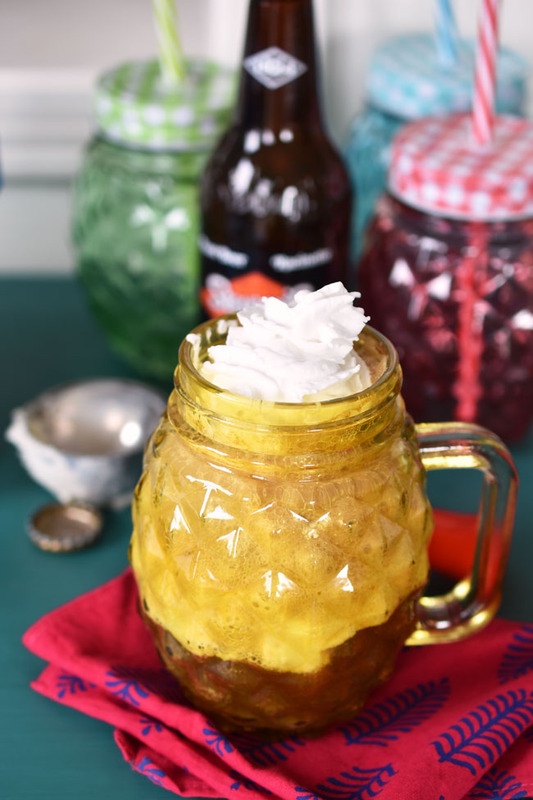 Love your plants in a mug Joann :) and making floats is always a treat! And so great that you partied with your kids, I love when they can pitch in and help! You would be welcome to eat them. Keep me from eating them! Haha. Thanks Sarah!